This Test shows just why Ishant Sharma is still a part of the Indian team. And that reason is not his batting - without which VVS Laxman wouldn't have been able to win India this great Test match. It's the attitude he brings, the determination and the temperament that has made him a favourite with the team management, and who can blame them? Struggling with his knee, Ishant bowled 10 no-balls in his 11 overs in the first innings, going for 71 runs. He went off, took injections for the pain, and came back on the next morning to field for more than a session so that he could bowl in the same innings. He might have been short on confidence, but he was not found wanting on the effort. In a scathing interview to ESPNcricinfo recently, India's former bowling coach Venkatesh Prasad spoke unflatteringly of some of Indian fast bowlers' attitude. Ishant, though, he couldn't stop praising. "He's somebody who works extremely hard at the nets," Prasad said. "He bowls in the nets at the same intensity with which he would bowl in a match. He has a great work ethic." Ishant has had reasons to work hard after his success in Australia in 2007-08. Results haven't always been forthcoming, but Ishant has battled away. On the fourth morning, after yet another disappointing first spell, Ishant was ready as ever when called for another. A little slice of luck, the Shane Watson bottom edge, worked wonders for the confidence, and for a brief period he was the same threatening bowler again. He was completing his action better, he was following through better, and he was now looking the batsman in the eye. Three wickets later, his job had been done. Not quite, as he discovered on the next morning. He came out to join Laxman, with 92 runs required for what looked like an impossible win. For the 106 minutes that followed, Laxman showed confidence in Ishant, who did nothing to suggest that the trust was misplaced. 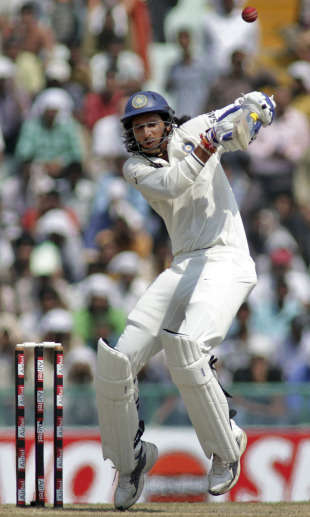 In fact Ishant faced more bowling than Laxman, who would often take singles early in the overs. They bounced Ishant, they yorked him, they tried to entice him with the flight, but nothing worked. He showed the temperament of a veteran, getting behind the short balls, not minding an odd blow in the shoulder area. The biggest attributes of his effort were how he left outside off, and how he was always awake to possibilities of running hard to manoeuvre the strike. Laxman was not stingy in praise for his partner-in-rescue. "He had been struggling with the injury," Laxman told ESPNcricinfo. "The last three-four days he has been taking injections on his leg. To come and bowl as well as he did yesterday, and then this innings, was a marvellous effort. "What impressed me most about him was the temperament. We had little chats in the middle. And when, towards the end, Mitchell Johnson troubled him, he told me he wasn't comfortable facing him. Then only I started to try and face more of Johnson. It was important to have that trust. There was no way I could have done it alone. But I have always had a lot of confidence in Ishant." When Ishant was finally dismissed, thanks to a heartbreakingly wrong decision considering how much hard work he had put in here, he could not be consoled. He smashed his bat into the ground on his way back, then into his pads, and walked like Inzamam-ul-Haq, if such a thing is possible for a tall, thin fellow. There will surely be Test matches where he will work half as hard, and walk away with match awards. And Tests like this, where he busts his gut for scant rewards, will make sure he is there to play the Tests more rewarding in nature.